In the Sacred Valley of the Incas, you can enjoy amazing mountain views, ancient Inca ruins and some extreme experiences; Such as zipline (zip line), rafting, mountain biking, paragliding, etc. 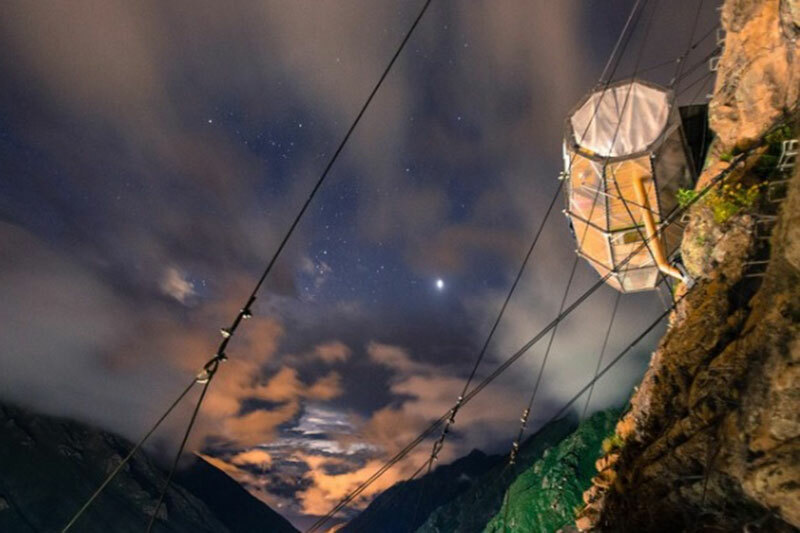 But you can also sleep incredibly; You can do Glamping, in a hotel suspended hundreds of meters above the Urubamba River; Sleep in a crystal sheath suspended from a cliff 360 meters high, in the Sacred Valley of the Incas. Natura Live Skylodge Adventure Suites, is just an example of “extreme glamping“. A fashion that has taken the travel industry by surprise. Glass pods hang from a cliff, on the Urubamba River, in the Sacred Valley of the Incas; Giving its guests an incomparable view of the landscapes, the valley, the mountains and the raging river below. As you might imagine, this hotel is not for everyone, it is recommended for people with a special taste for adrenaline and for those without fear of heights. A night under the starry sky of the Sacred Valley of the Incas. When you do glamping, there is no tent to lift, sleeping bag to unwind, no fire to ignite. Whether it’s a tent, yurt, sheath, igloo, cabin, chalet, cabin, bucket, tipi or tree house, doing glamping can experience life outdoors without sacrificing comfort and luxury. Glamping is a worldwide trend that has set fire to the outdoors; This offers you an “update”, variation, innovation, or whatever you want to call it, to your rest and recreation. The word glamping defines a new style of travel, where you can camp with glamor. How to get to a sheath at Natura Live Skylodge Adventure Suites? 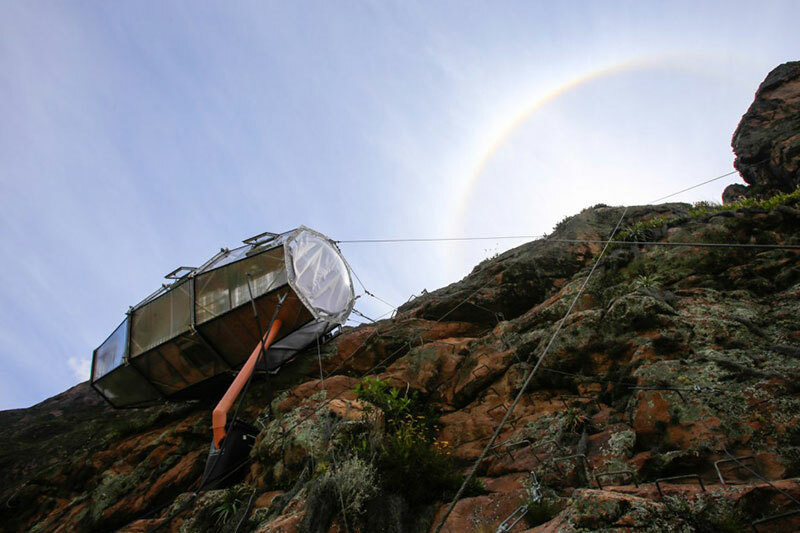 Sleeping in a “glass pod” suspended more than 300 meters high (1,000 feet) above the Urubamba River, is only part of the adventure. To reach these extreme dorms, you must cross the train tracks, climb some stairs and walk along the edge of a cliff holding steel cables; Or if you prefer to reach more extreme, you can slide through a dizzying zipline. To enter the sheath, you must do so through a roof hatch. The sheath are firmly anchored to the walls of the cliff. As for the accommodations; It has exquisite views of nature, the valley and the mountain range, are cogedores have a bedroom (for 4 people), a bathroom and a small dining room; And in spite of it you will still have enough space to relax and enjoy the Gourmet dinner and the bottle of wine that comes with your stay. The pods measure 2.30 m. (8 feet) high and 7.30 m (24 feet) wide. You will have enough space to stretch your legs. The sheath has four ventilation windows in case it begins to feel claustrophobia; These are at the top. Each Skylodge (pod) accommodates four people and costs about $ 300 per person. If you want to book the entire pod, the fee can be $ 1,000. The number of pods is extremely limited, so it will be necessary to book in advance, they are a total of 3 clear glass capsules; Two of them are intended for customers, and the other is for service personnel only. Want to book a pod at the Natura Live Skylodge Adventure Suites, you can do so through http://naturavive.com/web/skylodge-adventure-suites/. If you are already on your way to Machu Picchu, you may want to enjoy this unique experience.